BlackBerry surprised Wall Street by releasing its second quarter earnings early on Friday, but it was hardly the kind of surprise where a dancer jumps out of a cake. The Canadian smartphone maker warned the market that it expects to post revenues of around $1.6bn when it files its formal earnings report on September 27 – a ghastly sum that's barely half the $3.06bn that the analysts polled by Yahoo! Finance were expecting. Further salting shareholders' wounds, the company said it expects to show a net operating loss of between $950m and $995m for the quarter ending August 31. That will translate into a loss of between $0.47 and $0.51 per share, Reuters reports, more than three times worse than the $0.15 loss per share that the market-watchers expected. How the analysts managed to miss the mark by such a wide margin isn't clear. But the simple fact is that BlackBerry's latest handsets aren't selling; it reportedly shipped around 3.7 million phones in the quarter, down from 6.8 million in the first quarter and half as many as it moved in the previous year's Q2. Not surprisingly, BlackBerry said it will take immediate steps to put the brakes on its losses, even as its share price fell off a cliff on Friday. 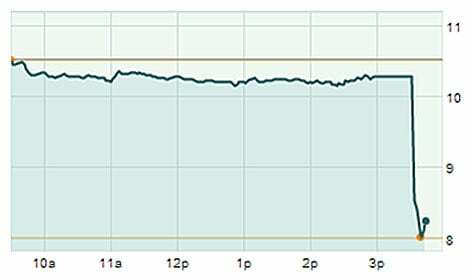 Despite a brief halt in trading, its shares were down 17.06 per cent by the closing bell, setting a new 52-week low. As expected, layoffs are first on CEO Thorsten Heins' list of emergency measures. The company confirmed that it will issue pink slips to around 4,500 employees, equal to roughly 40 per cent of its global staff. MarketWatch reports that BlackBerry also plans to tighten the focus of its future products to concentrate on the enterprise and "prosumer" markets. Instead of the six handsets it originally had planned, it will now produce only four, including two high-end models and two entry-level ones. Over the long term, however, this latest devastating news is sure to add fuel to speculation that BlackBerry is an acquisition target. Microsoft is widely thought to be circling the struggling Canadian firm, having already snapped up Nokia for what many saw as a bargain price.